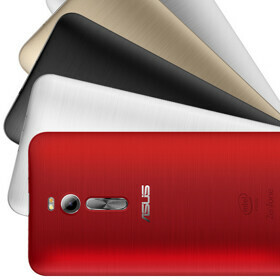 Asus today announced that its ZenFone 2 will be officially available in Europe starting tomorrow, March 31. The first European market to get the new handset is France, where customers will be able to find the ZenFone 2 via Asus Shop, as well as at locations like Auchan, Darty, and Cdiscount. Asus is bringing three ZenFone 2 models to Europe, all running Android 5.0 Lollipop out of the box. First we have the ZenFone 2 ZE551ML, which is the series' flagship, offering features like a 5.5-inch 1080p display, a 64-bit quad-core Intel Atom Z3580 processor clocked at 2.34 GHz, 4 GB of RAM, 5 MP front-facing camera, 13 MP rear camera, and 32 GB of internal memory. For a limited period of time, Asus France will sell the ZenFone 2 ZE551ML for just €299 (its regular price will be €349). The second ZenFone 2 model, the ZE550ML, also comes with a 5.5-inch screen, but its resolution is of only 720 x 1280 pixels. The ZE550ML further features a quad-core 1.8 GHz Intel Atom Z3560 processor, 2 GB of RAM, and 16 GB of storage space. The handset costs €249. Finally, the cheapest ZenFone 2 is the ZE500CL, which offers a 5-inch 720p display, a dual-core 1.6 GHz Intel Atom Z2560 processor, 2 MP front-facing camera, 8 MP rear camera, 2 GB of RAM, and 8 GB of internal memory. Asus will sell the ZE500CL for €179. We assume that Asus will soon launch the ZenFone 2 in other European markets, as well as in North America (where the 5-inch ZE500CL model is already available, though not directly from Asus). 5" variant not only has worse specs, it's also very big. It's basically as big as 5,5" version! It's just slightly smaller but still massive for a 5 inch device. Matter of perspective.. I'm willing to compromise a bit on 1 handed op as long as a 5.5" phone negates the need to carry along a tab, which is what most phablets does very well. Pa next time get the variants of the zenfone right when you post a article about which one is being benchmarked because last time you got the low and high end models mixed up and made it seem as if the low end model had the better benchmark score smh sloppy sloppy. it has the same scores benchmark wise as the galaxy note 4 it really is a high end like phone bro. benchmarks are not everything and few people look at them, and sure i would probably go for the full-hd zenfone cause it's awesome and i know stuff about smartphones but i just stated that very few people will. 350€ is a well-known, premium brand terittory... on the other hand i think the 250€ hd zenfone will go very well. 4GB of RAM is needed for what? Only Samsung S6 is DDR4, the rest including S5, Note 3, Note 4 are still DDR3 same as Asus. Yeah half price though. People always forget about that important spec. It's dual-channel 4GB RAM if you read previous specs.. Of course DDR4 is out of the question, GS6 is a flagship, unfair comparison. Also the display resolution is stressing the GPU too much on the GS6, causing lower than expected framerate.. Even the 8-core Mali T760 has trouble handling 2K competitively. Android caches apps for quicker multi tasking. In fact the OS has a habit of cache up to 80% available RAM. The next gen of mobile games with OpenGL ES 3.1+AEP will definite require 2GB or 3GB as minimum, 4GB as recommended. yes, like the horse power on S6, and it's QHD screen. all they need is optimization, the specs is way over powerful. just look at the on-screen performance of S6, it's really bad. if only Samsung went with 1080p on S6, i will definitely buy it, i've seen the performance of QHD on the Note 4, and no thanks. How does that Atom Z3580 stack up against the Snapdragon 801? You again. http://forums.anandtech.com/showthread.php?t=2417274 "Benchmarks from the video They did not list clock speed for the comparable parts. That said they mention MSM8974 which is Qualcomm's Snapdragon 800 chip (no clue on clockspeed) Mobile XPRT Z3580 Quad Core at 2.2 ghz - 300 Krait 400 Quad Core - 159 A53 Octo Core - 143 A7 Octo Core - 125 A7 Quad Core - 95 webXERT Z3580 Quad Core at 2.2 ghz - 581 Krait 400 Quad Core - 382 A53 Octo Core - 173 A7 Octo Core - 165 A7 Quad Core - 132 GFX Bench T-Rex Offscreen Z3580 Quad Core at 2.2 ghz - 31 Krait 400 Quad Core - 26.7 A53 Octo Core - 14.9 A7 Octo Core - 10.3 A7 Quad Core - 3.8 3d Mark Ice Storm Unlimited Z3580 Quad Core at 2.2 ghz - 20790 Krait 400 Quad Core - 16179 A53 Octo Core - 9363 A7 Octo Core - 5385 A7 Quad Core - 2898" Again smokes the 801 unless of course you trust the other guy.